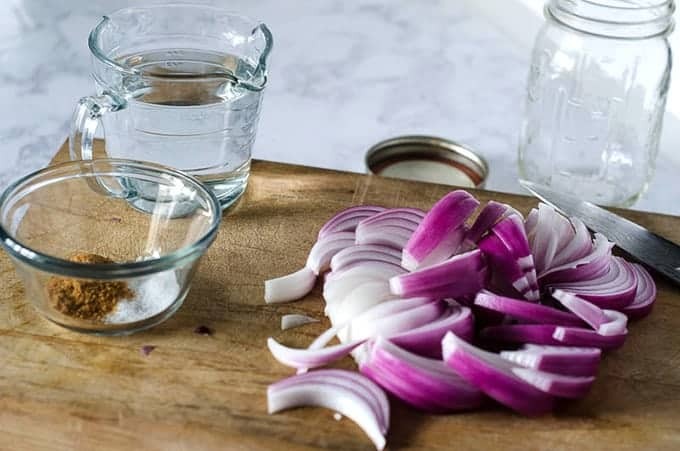 This recipe for pickled red onions is quick, easy, and will add the perfect tang to any dish. They are sure to be a new favorite you reach for again and again. 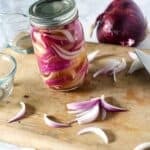 These pickled red onions are so easy to make! With just four ingredients, you will have them made in no time. I’m a big fan of pickled things – except for pickles. Weird, right? Thing is, I don’t like cucumbers. So I don’t like pickles. But give me all your other pickled things. Peppers, okra, green tomatoes, brussel sprouts (yes, that’s a thing, and yes, they’re good). And especially these red onions. So let’s make them, shall we?! These are pretty easy to make, but here are a few tips and tricks to help you out. First, slice your red onion into strips like these. Then pack them into a mason jar. You want to pack as many in as you can, so push them down and get them in there tightly! Sprinkle the sugar (coconut or otherwise) and salt over the top. Pour the vinegar into the jar, all the way to the top. Screw the lid on the jar tightly, shake well to mix, and you’re done! 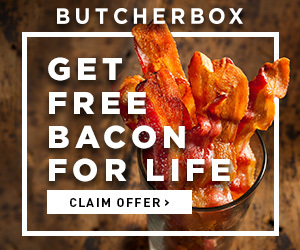 Give them at least 24 hours in the fridge before diving in. Try to think outside the box on ways you could use these. They’d be so good chopped up and sprinkled on top of this Sweet Potato Salad, or served with these Jamaican Hot Pepper Shrimp from Charla over at That Girl Cooks Healthy. If you are feeling lazy or thrifty, you can reuse the liquid in the jar one more time. Just cut up another red onion, pack it into the liquid, and stick it back in the fridge for a few days. If you’re not paleo or don’t have coconut sugar, you can substitute regular sugar instead. These will be ready to use after about 24 hours, but will gain their best flavor after about a week. You can use this recipe to pickle anything. 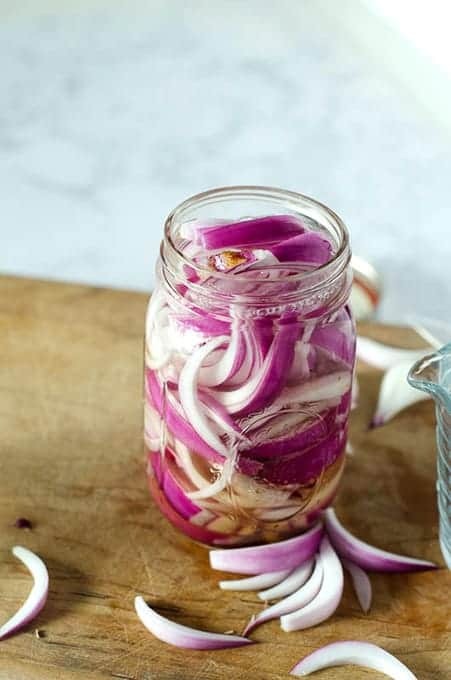 Just replace the red onions with whatever it is you want to pickle! 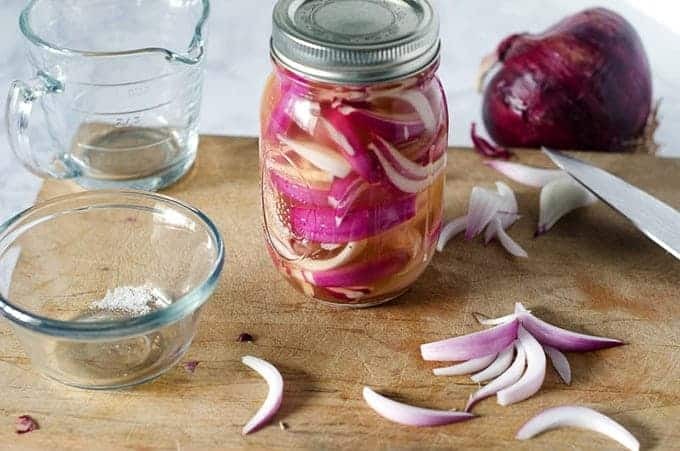 If you’ve tried this pickled red onion recipe or any other of my recipes on the blog, I want to see! Tag me on social media and follow along for more delicious recipes. You can find me on Facebook, Instagram and Pinterest to see more delicious food and what I’m getting into. 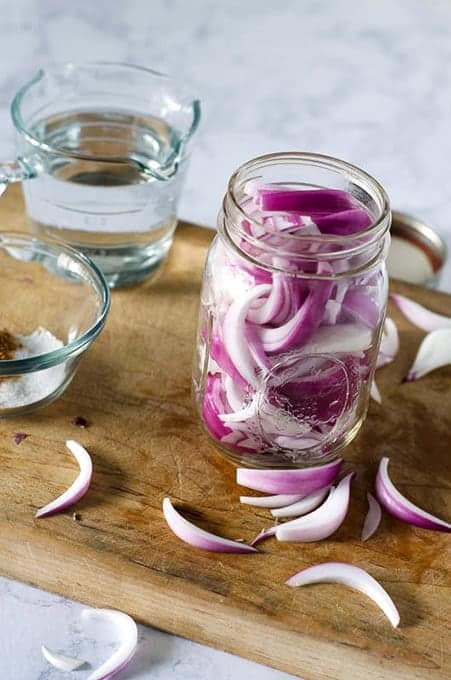 Tart and tangy pickled red onions that make the perfect topping for a variety of dishes! Thinly slice the onion into rings, then cut them in half so you are left with half circles. 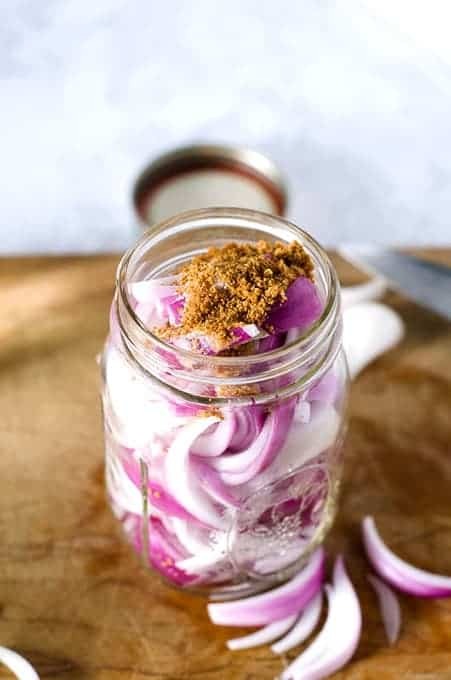 Place all the red onion slices into the jar, packing them in. Sprinkle the onions with the coconut sugar and kosher salt. Pour the vinegar over the onions until they are completely covered. Screw the lid onto the jar, then shake it around to mix in the salt and sugar and get everything covered with the vinegar. Place in the fridge for 1-2 weeks to achieve optimum pickled-ness! If you want to use another type of vinegar, that's fine too! White wine vinegar works really well also. Nutrition facts are for the WHOLE JAR. Serving size varies depending on use, but is typically just a few onion slices. Thank you for the recipe…these were VERY good! I followed the recipe exactly and had coconut sugar on hand. 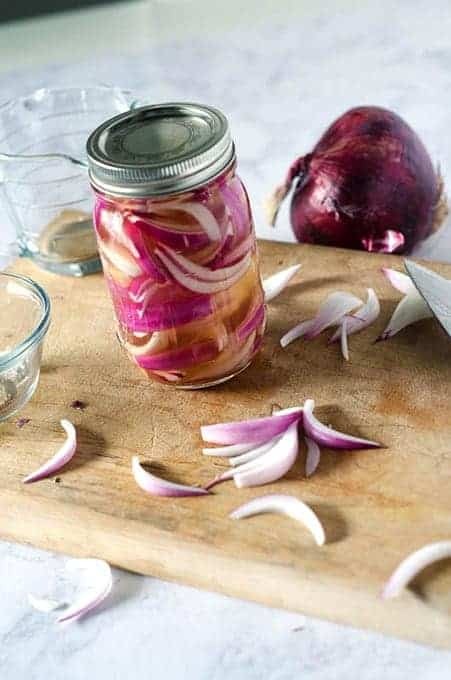 Only change I had to make is that our red onions here are SO big that I used a 32 oz Ball Jar and doubled the ingredients for the brine. I made them on a whim on Thursday (so SIMPLE) and am eating them on a Monday. I think they need a bit more time as they are still strong, but yummier, and WAY less intense than a raw red onion. What other veggies have you tried in these? I have so many veggies I would love to try! Yes the longer you let them sit, the better they are! You really can use any veggie you’d like. I’ve done white onions and carrots among other things. You can really put anything in it! So glad you enjoyed.